So what age is it that you can’t wait to leave your own party because you are tired. We hosted a party this weekend. I can remember in my 20’s when we didn’t even go out to the bars until 10PM. Now 10PM is the time we are coming home. I don’t know how many more years I have before I dye my hair blue and am eating dinner at 5PM (with a coupon). In my 20’s I could go to bed with a dirty place after a party and deal with it in the morning. Now in your 30’s/40’s, somehow you get all responsible and feel the need to spend an hour cleaning up before you go to bed so you don’t have to deal with it in the morning. All I gots ta say is, keep off my lawn! Party? I don’t even know what that is. Why would you want a bunch of messy people in your place? Well perhaps a party has its advantages, then. Too late, invites already went out. Cruel and unusual Wombie punishment! Oh this is spot on. Spot on. I so remember staying up all night and then working all day then doing it again. Not anymore. It all depends on the party. I’ve hosted or attended (usually obligatory) events where I wished everyone would leave (or wished I could leave without being rude) after an hour, as soon as the main food was over because people were annoying or boring me. OTOH I’ve hosted or been to events (typically involving good music and dancing) where I’m like what 12:00 already hey I’m just getting started. And I’m mega-old. It’s them leafy greens. Asa man in the tail in of my thirties, I can but agree. How long do wombats live? The oldest wombats live to around 30, with 34 being the oldest ever recorded. There are three in captivity now that are 28. Ugh…the thought of throwing a party now days makes me wanna throw up! Do you vomit blood like your characters? Partying in my 60’s will consist of visiting this blog. We don’t discuss parties at my house 😉 I should learn from Hunter S Thompson. Discuss them or have them? Then you should wake up refreshed to clean up. It’s a survival mechanism to not party all the time, party all the time, party all the time. If we did, we’d start looking old and haggard. Besides, I like early morning coffee conversations with people who want to change the world for the better. Oh man, this is so true! We even have to clean before the party, as well as after. I try to clean as we go but my wife says it makes people think we are trying to run people out the door. You’re pooped already in your 30s? i would think maybe 50s. Same with me, Bearman. I used to party hard all night long from about 18 years old until about 28. That’s ten years of putting my mind and body through party heaven and hell. Now, I love to go to bed early and wake up even earlier so that I can have a cup of coffee in complete silent bliss, drawing, reading, creating. I have always been good in the early Am and late at night…it is middle of the day I am a mess. It’s a good thing that unproductive time is taken up by work, then. Yes, I always wake up to find things glued to my back and hair. Those silly students! That’s more because you are anti-social than because you are tired. Great way to phrase it. I was never one to get drunk. I got a little overserved at our honeymoon and my wife says I became overly friendly with strangers, trying to set up couple dates for later in the week. I imagine, Tony, that each of your beers is a big 1 liter glass! I’ll remember that when I come over today! He kicked me out right after I finished the cake! I should have kicked you out BEFORE you finished the cake. Never really been a drinker… I was pretty damn boring in my twenties. I still stay up crazy late though! I drink but rarely more than a few beers. I don’t feel like wasting my entire day with a hangover. No, forget it. I said nothing. Those are the young’n days. I have the same feeling. It is nothing for my west coast friends to take an hour to get to a dinner locale. Me, 15 minutes is my max. It’s actually easier throwing a party when everyone is in their 30’s; most folks never show up due to prior engagements (or some such rot). And they leave early cuz of kid issues. Don’t worry. In your 40s everyone is gone by 10 pm because they want to get to bed themselves. There are always the stragglers. 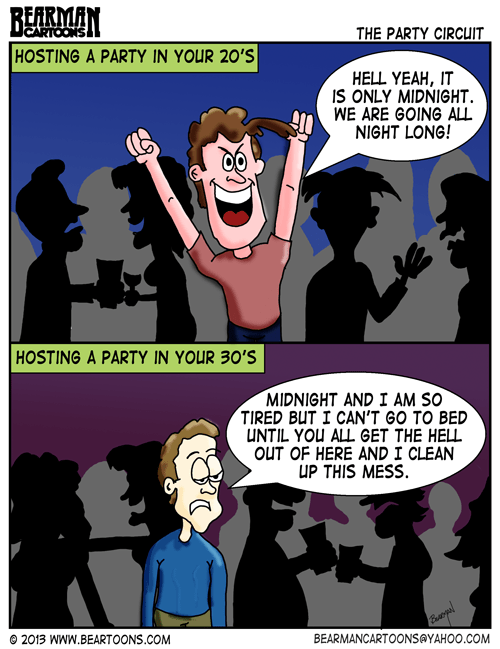 Hate to say it, but a lot of times I’m this 30 year old guy as illustrated. Geesh….I used to be the opposite. I’m old.